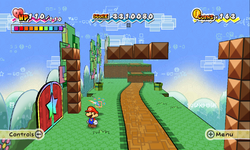 This article is about the move used in Super Paper Mario. For the Bonus Challenge in the Yoshi's Island games with the name usually shortened as "Flip", see Flip Cards. Flip is a technique used by Mario in the game Super Paper Mario. At the push of the button, Mario goes from 2D to 3D, with the point of view rotating by 90° clockwise horizontally. However, there is a time limit as to how long he can stay in 3D, since his Flip Meter will gradually decline, eventually dealing Mario one damage once it hits bottom, at which point it resets. Getting damaged by an enemy or using a healing item will also reset the Meter, and once Mario collects his own Catch Card, the Meter will never run down. The ability was given to Mario by Bestovius in return for all the money in Mario's possession, or for free, depending on whether or not the player refuses Bestovius's offer. However, Mario is not the only character in the game with the ability to flip dimensions. Throughout the game, there are many enemies with a dotted line around them that can also flip, and will follow Mario into 3D to continue attacking him, and some enemies, like the Cursya, are three-dimensional to begin with. Some bosses, such as Mimi and Dimentio, can also flip. While most of the time going 3D will solve problems, there are also some times where it actually complicates movement. For example, in 2D there may be a straight line of ? Blocks. In 3D, the blocks could end up being totally separated on opposite sides of the levels. The Flip technique in Paper Mario: Color Splash. Note the 10 time units Flip Meter in the upper right corner. Flip returns in Paper Mario: Color Splash, in a course dedicated to Super Mario Bros. 3 found at the Green Energy Plant. It has again a 10 time units limit, this time corresponding to 10 seconds instead of 20 seconds, and the 3D point of view is not horizontally orthogonal, but rather horizontally and vertically diagonal with respect to the 2D point of view. Activating Flip requires an equal amount of the three types of paints. When 3 seconds remain in the timer, the borders of the screen start flashing white and when the Flip Meter is empty, Mario is forced to return to the 2D perspective. The Flip Meter is completely filled as soon as Mario returns to said perspective, and it is possible to reactivate Flip immediately after, if Mario is carrying enough paint to do so. This page was last edited on August 31, 2018, at 13:04.